This is a list of the National Register of Historic Places listings in Redwood County, Minnesota. It is intended to be a complete list of the properties and districts on the National Register of Historic Places in Redwood County, Minnesota, United States. The locations of National Register properties and districts for which the latitude and longitude coordinates are included below, may be seen in an online map. There are 22 properties and districts listed on the National Register in the county. A supplementary list includes four additional sites that were formerly on the National Register. 44°13′44″N 95°16′06″W﻿ / ﻿44.228817°N 95.26825°W﻿ / 44.228817; -95.26825﻿ (J.A. Anderson House) Lamberton Redwood County's most prominent example of a Queen Anne house, built circa 1900. (#80002141) 105 E. 2nd St.
44°32′26″N 95°07′09″W﻿ / ﻿44.540588°N 95.119146°W﻿ / 44.540588; -95.119146﻿ (Bank of Redwood Falls Building) Redwood Falls Small bank building constructed circa 1885, significant for the integrity of its outsized Richardsonian Romanesque features on the Redwood Falls streetscape. 44°32′01″N 94°59′49″W﻿ / ﻿44.533529°N 94.996982°W﻿ / 44.533529; -94.996982﻿ (Birch Coulee School) Morton vicinity Schoolhouse active 1891–1920 on the Lower Sioux Indian Reservation, a reminder of federal efforts at cultural assimilation of Native Americans through formal education. The earliest and best preserved of Minnesota's surviving Native American education facilities. 44°24′39″N 95°24′35″W﻿ / ﻿44.410788°N 95.409712°W﻿ / 44.410788; -95.409712﻿ (Chicago and North Western Railroad Depot) Lucan 1902 railway station symbolizing the key role of railroads in the area's agricultural development and the siting of its towns. (#80002142) 4th and Minnesota Sts. 44°32′20″N 95°07′15″W﻿ / ﻿44.538921°N 95.120788°W﻿ / 44.538921; -95.120788﻿ (H.D. Chollar House) Redwood Falls Redwood Falls' only Italianate house, built c. 1878. Also noted for its owner's association with the local railside lumber yard, an important early business in most area towns. (#80002133) Douglas St. and 2nd Ave.
44°13′51″N 95°15′55″W﻿ / ﻿44.23085°N 95.265348°W﻿ / 44.23085; -95.265348﻿ (City Blacksmith Shop) Lamberton c. 1898 blacksmith shop with much of its original equipment, a leading example of a key service in many of the area's communities catering to the agricultural sector. Now managed by the Lamberton Area Historical Society. (#80002130) 1st and Pine Sts. 44°22′50″N 95°03′11″W﻿ / ﻿44.380546°N 95.053164°W﻿ / 44.380546; -95.053164﻿ (Clements State Bank Building) Clements 1902 bank building—founded, like the Milroy State Bank Building, by businessmen from Springfield, Minnesota—representing the commercial investment of outsiders in a string of towns platted on a new railroad line. 44°23′24″N 95°09′06″W﻿ / ﻿44.389942°N 95.151654°W﻿ / 44.389942; -95.151654﻿ (District No. 8 School) Clements vicinity 1908 example of Redwood County's rural schoolhouses, particularly notable for the retention of its original outbuildings (a barn and outhouse). 44°27′46″N 94°59′40″W﻿ / ﻿44.462823°N 94.994434°W﻿ / 44.462823; -94.994434﻿ (Gilfillan) Redwood Falls vicinity 1882 farm of Charles Duncan Gilfillan (1831–1902) and his son (1872–1962), significant for their role in developing St. Paul and Redwood County, and their promotion of progressive farming in southwest Minnesota. The large farmstead is also associated with the alienation of seized Dakota reservation land. Now managed by the Redwood County Historical Society. 44°36′21″N 95°19′47″W﻿ / ﻿44.605855°N 95.329753°W﻿ / 44.605855; -95.329753﻿ (Gimmestad Land and Loan Office) Belview Rare intact example of an early office building—built in 1892—and a representative of the once-common land and loan offices that promoted small town commerce. (#80002138) North and Main Sts. 44°33′52″N 95°05′41″W﻿ / ﻿44.564434°N 95.094652°W﻿ / 44.564434; -95.094652﻿ (Honner-Hosken House) North Redwood 1872 home of notable settler J.S.G. Honner (d. 1888) and later Thomas Hosken (d. 1929), Honner's successor in a locally important quarrying operation. 44°31′34″N 94°57′28″W﻿ / ﻿44.52616°N 94.957838°W﻿ / 44.52616; -94.957838﻿ (Lower Sioux Agency) Morton Site of the 1853 federal administrative center for the Lower Sioux Indian Reservation, destroyed at the outbreak of the Dakota War of 1862. Now a state/tribal museum containing a restored 1861 stone warehouse. (#80002137) Superior St. and Euclid Ave.
44°25′08″N 95°33′14″W﻿ / ﻿44.418877°N 95.553795°W﻿ / 44.418877; -95.553795﻿ (Milroy State Bank Building) Milroy 1902 bank building—founded, like the Clements State Bank Building, by businessmen from Springfield, Minnesota—representing the commercial investment of outsiders in a string of towns platted on a new railroad line. 44°36′26″N 95°19′48″W﻿ / ﻿44.607236°N 95.329978°W﻿ / 44.607236; -95.329978﻿ (Minneapolis and St. Louis Railroad Depot) Belview 1892 railway station symbolizing the key role of railroads in the area's agricultural development and the siting of its towns. 44°36′16″N 95°19′45″W﻿ / ﻿44.604558°N 95.329209°W﻿ / 44.604558; -95.329209﻿ (Odeon Theater) Belview Well-preserved example of a rural theater hall, built in 1901, with simplified Queen Anne architecture. 44°33′03″N 95°07′30″W﻿ / ﻿44.55088°N 95.124961°W﻿ / 44.55088; -95.124961﻿ (Ramsey Park Swayback Bridge) Redwood Falls Unique park bridge built by the Works Progress Administration in 1938. (#80002139) 334 S. Jefferson St.
44°32′20″N 95°07′00″W﻿ / ﻿44.538957°N 95.116609°W﻿ / 44.538957; -95.116609﻿ (Redwood Falls Carnegie Library) Redwood Falls 1904 Carnegie library, significant for having the most intact exterior of Redwood County's early educational buildings. 44°32′28″N 95°07′13″W﻿ / ﻿44.541054°N 95.120342°W﻿ / 44.541054; -95.120342﻿ (Redwood Falls Retaining Wall Roadside Development Project) Redwood Falls Exemplary early roadside development built 1934–36 by the Minnesota Department of Highways to increase safety and aesthetics along the developing state highway system. 44°13′21″N 95°21′55″W﻿ / ﻿44.222504°N 95.365384°W﻿ / 44.222504; -95.365384﻿ (Revere Fire Hall) Revere Fire station built c. 1900, representative of common, specialized municipal buildings. 44°32′00″N 94°59′43″W﻿ / ﻿44.533449°N 94.995314°W﻿ / 44.533449; -94.995314﻿ (St. Cornelia's Episcopal Church) Morton vicinity Church built 1889–91 for a returning Dakota congregation after years of exile from Minnesota following the Dakota War of 1862. Also an example of the Episcopal missionary work among Native Americans and fine Gothic Revival church construction under Bishop Henry Benjamin Whipple. (#80002140) 2nd and Mill Sts. 44°32′25″N 95°07′09″W﻿ / ﻿44.54032°N 95.119216°W﻿ / 44.54032; -95.119216﻿ (Scenic City Cooperative Oil Company) Redwood Falls Distinctive service station built c. 1925, dating to the advent of widespread automobile use in Redwood County. 44°13′22″N 95°28′09″W﻿ / ﻿44.222821°N 95.469044°W﻿ / 44.222821; -95.469044﻿ (Walnut Grove Creamery Association) Walnut Grove 1930 cooperative milk-processing facility, a well-preserved example of the small early-20th-century creameries serving the region's dairy farming industry. (#80002146) January 31, 2019 Front and Main Sts. Wabasso 1901 example of a privately funded, frame hotel serving a small-town railroad junction. Demolished circa 2010. (#84001687) November 1, 2018 3rd St.
Delhi 1896 community band hall significant as the venue for many political and social events in Delhi Township's development. Demolished in 2007. (#80002134) February 13, 1991 1st Ave. and Douglas St.
Lamberton Unusual brick grain elevator built in 1916. Fell into disrepair and demolished by the city in 1989. (#80002136) August 2, 2000 Euclid Ave. and Cherry St.
Milroy 1902 Italianate commercial building. Demolished in 1998. ^ Gimmestad, Dennis A. (September 1978). "Minnesota Historic Properties Inventory Form: Anderson, J. A., House" (PDF). National Park Service. Retrieved 2013-10-01. ^ Gimmestad, Dennis A. (September 1978). "Minnesota Historic Properties Inventory Form: Bank of Redwood Falls Building" (PDF). National Park Service. Retrieved 2013-10-01. ^ Koop, Michael (February 1989). "National Register of Historic Places Registration Form: Birch Coulee School" (PDF). National Park Service. Retrieved 2013-10-01. ^ Gimmestad, Dennis A. (September 1978). "Chicago & North Western Railroad Depot" (PDF). National Park Service. Retrieved 2013-10-01. ^ Gimmestad, Dennis A. (September 1978). "Minnesota Historic Properties Inventory Form: Chollar, H. D., House" (PDF). National Park Service. Retrieved 2013-10-01. ^ Gimmestad, Dennis A. (September 1978). "Minnesota Historic Properties Inventory Form: City Blacksmith Shop" (PDF). National Park Service. Retrieved 2013-10-01. ^ Hagedon, Emily. "Hanzlik Blacksmith Shop". Retrieved 2012-08-29. ^ Gimmestad, Dennis A. (September 1978). "Clements State Bank Building" (PDF). National Park Service. Retrieved 2013-09-03. ^ Gimmestad, Dennis A. (September 1978). "School District #8" (PDF). National Park Service. Retrieved 2013-10-01. ^ Gimmestad, Dennis A. (September 1978). "Gilfillan" (PDF). National Park Service. Retrieved 2013-10-01. ^ "Gilfillan Estate". Redwood County Historical Society. Retrieved 2013-10-01. ^ Gimmestad, Dennis A. (September 1978). "Gimmestad Land and Loan Office" (PDF). National Park Service. Retrieved 2013-09-13. ^ Gimmestad, Dennis A. (September 1978). "Honnor-Hosken House" (PDF). National Park Service. Retrieved 2013-09-13. ^ Address derived from "Lower Sioux Agency". Minnesota Historical Society. Retrieved 2012-08-29. NRIS database lists site as "Address restricted." ^ Grossman, John (1970-03-23). "National Register of Historic Places Inventory – Nomination Form: Lower Sioux Agency". National Park Service. ^ "Lower Sioux Agency". Minnesota Historical Society. Retrieved 2012-08-29. ^ Gimmestad, Dennis A. (September 1978). "Milroy State Bank Building" (PDF). National Park Service. Retrieved 2013-09-03. ^ Gimmestad, Dennis A. (September 1978). "Minneapolis and St. Louis Railroad Depot" (PDF). National Park Service. Retrieved 2013-09-03. ^ Harren, Henry M. (1974-02-01). "National Register of Historic Places Inventory – Nomination Form: Odeon Theater" (PDF). National Park Service. Retrieved 2013-09-03. ^ Gimmestad, Dennis A. (September 1978). "Ramsey Park Swayback Bridge". National Park Service. Retrieved 2013-06-29. ^ Gimmestad, Dennis A. (September 1978). "Redwood Falls Public Library". National Park Service. Retrieved 2013-06-29. ^ Granger, Susan; Scott Kelly (February 2012). "National Register of Historic Places Registration Form: Redwood Falls Retaining Wall Roadside Development Project" (PDF). National Park Service. Retrieved 2013-06-29. ^ Gimmestad, Dennis A. (September 1978). "Revere Fire Hall". National Park Service. Retrieved 2013-06-29. ^ Gimmestad, Dennis (September 1978). "National Register of Historic Places Registration Form: St. Cornelia's Episcopal Mission Church". National Park Service. Retrieved 2013-06-29. ^ Gimmestad, Dennis A. (September 1978). "Scenic City Cooperative Oil Company Building". National Park Service. Retrieved 2013-06-29. ^ Granger, Susan; Scott Kelly (2006-03-13). "National Register of Historic Places Registration Form: Walnut Grove Creamery Association". National Park Service. Retrieved 2013-06-29. ^ Gimmestad, Dennis A. (September 1978). "Minnesota Historic Properties Inventory Form: Commercial Hotel" (PDF). National Park Service. Retrieved 2013-10-01. ^ Ockwig, Jerry (1984-03-01). "National Register of Historic Places Inventory–Nomination Form: Delhi Coronet Band Hall" (PDF). National Park Service. Retrieved 2013-10-01. ^ Ganzel, Emily (2018-09-20). "Request for Removal from the National Register of Historic Places: Delhi Coronet Band Hall". Minnesota Historical Society. ^ "Milroy Block (removed)". Minnesota National Register Properties Database. Minnesota Historical Society. Retrieved 2012-09-23. ^ Nord, Mary Ann (2003). The National Register of Historic Places in Minnesota. St. Paul, Minn.: Minnesota Historical Society. ISBN 0-87351-448-3. 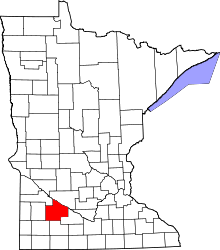 Wikimedia Commons has media related to National Register of Historic Places in Redwood County, Minnesota. This page was last edited on 5 March 2019, at 03:47 (UTC).